Harry Sundheim, Chicago (acquired from the artist, 1963). (possibly) B.C. Holland Gallery, Chicago. Rainer Hortsmann, Düsseldorf (possibly acquired from the above, 1970). Ernst D.E. Fischer, Krefeld (February 1971). Dr. Rainer Radmann, Düsseldorf (acquired from the above). Private collection, Germany (acquired from the above); sale, Christie's, New York, 6 November 2007, lot 6. Letter from R. Magritte to H. Torczyner, 28 December 1963, in H. Torczyner, L'ami Magritte: Correspondance et souvenirs, Antwerp, 1992, letter no. 309, pp. 264-265. Letter from H. Torczyner to R. Magritte, 3 January 1964, in H. Torczyner, L'ami Magritte: Correspondance et souvenirs, Antwerp, 1992, letter no. 311, p. 271. Letter from R. Magritte to H. Torczyner, 4 January 1964, in H. Torczyner, L'ami Magritte: Correspondance et souvenirs, Antwerp, 1992, letter no. 312, p. 271. D. Sylvester, ed., René Magritte: Catalogue Raisonné, Gouaches, Temperas, Watercolours and Papiers Collés, 1918-1967, London, 1994, vol. IV, p. 261, no. 1541 (illustrated). La recherche de l'absolu is a variation on an idea that Magritte first depicted in three oil paintings at the end of 1940 (Sylvester, nos. 481-483). Magritte described these canvases to the Belgian playwright Claude Spaak in a letter from January 1941, stating: "Among the recent canvases, there are three versions of 'The Search for the Absolute,' which is a leafless tree (in winter) but with branches that provide the shape of a leaf, a leaf even so! One version takes place in the evening with a setting sun, another in the morning with a white sphere on the horizon, and the third shows this great, self-willed leaf rising against a starry sky" (quoted in D. Sylvester, op. cit., p. 282). In the present work, this theme reappears in the delicately tinted tones, more translucent handling, and intimate scale of gouache on paper, a medium that Magritte employed alongside oil and watercolor throughout his career. The title of the present gouache likely stems from the novel La recherche de l'absolu (The Quest for the Absolute) by Honoré de Balzac (1834), which portrays the destructive effects of one man's obsession with alchemy and a quest for absolute truth. Magritte often took inspiration from literature, film, and musical scores when coming up with titles for his canvases, and he also invited suggestions from friends such as the writers Paul Nougé and Louis Scutenaire, who is thought to have contributed the title for the present work. As in many of Magritte's paintings after 1930, the title has a tenuous, indirect or seemingly incongruous relationship with the imagery, through which the artist invites the viewer to build associations on his own. The mysterious and almost totemic tenor of the present image manifests Magritte's longstanding admiration for the work of the Italian painter Giorgio de Chirico, whose poetic combination of unrelated objects in works such as Le chant d'amour, 1914 had been instrumental to the Belgian painter's embrace of surrealism around 1925. Magritte's deadpan style of representation sets formal rationalism against an improbable and fantastical sense of scale; the ball is an oppressive presence when contrasted with the miniscule figures, yet without the suggestion of the landscape setting, the gouache could almost pass for a purely scientific representation of two frontal, hand-sized objects. 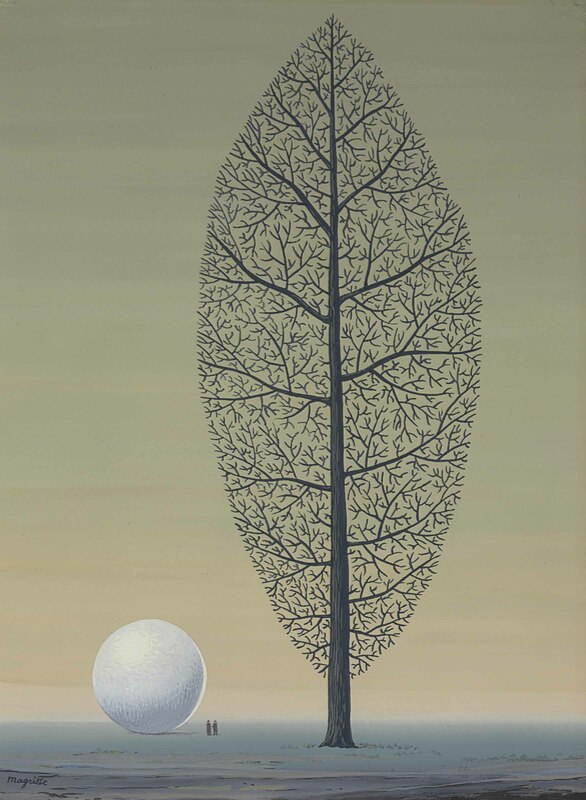 Magritte's use of an enlarged leaf to represent a tree, the substitution of a part for the whole, underscores his exploration of provocative encounters between objects that are based on an inherent association with each other. The artist first adopted this approach in a work that he titled Les affinités électives, 1933 (Sylvester, no. 349; fig. 1) after Johann Wolfgang von Goethe's novel Elective Affinities (1809). Magritte explained in 1938 that creating this image of a birdcage, which contains an enormous egg, introduced him to "a new and astonishing poetic secret" whose "shock had been caused precisely by the affinity of two objects" (quoted in H. Torczyner, Magritte: The True Art of Painting, New York, 1977, p. 121). Continuing this game of affinities, the leaf-shaped tree also suggests a circulatory system as it branches through a human lung, lending the image a human aspect, which further contrasts with the hard, inanimate perfection of the ball. The branching lines describe the nature of the quest; they are a series of paths to be chosen and taken while none actually leads to the absolute.